Striker Roberto Soldado has moved from Tottenham to Spanish side Villarreal in a deal worth a reported £7m. 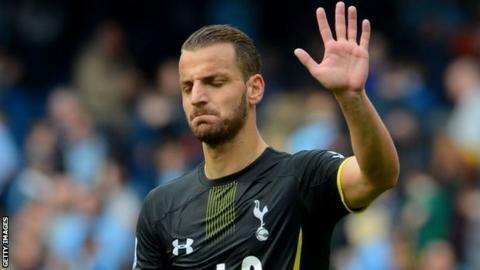 Soldado, 30, cost Spurs a club record £26m when he signed from Valencia in August 2013 but he only managed seven goals in 52 Premier League appearances. "This is a very important step in my career," said Soldado, who has agreed a three-year contract with Villarreal. "When their offer arrived I didn't hesitate as it's a great opportunity to return to Spain and join a big club." Soldado began his career at Real Madrid, scoring 63 goals in 120 league appearances for their B side, before moves to Getafe, Valencia and then Tottenham. He has won 12 international caps for Spain and believes this move can help him regain his best form. "I've been away for two years in which I haven't been able to give my best, but I'm convinced that I can score lots of goals for Villarreal," added Soldado. "I've spent two very difficult years in England where I lost my confidence. Villarreal's interest has given me the enthusiasm to do great things. "I want to return to play at a good level and score lots of goals. I want to go back to being the player I used to be." Villarreal finished sixth in La Liga last season and will compete in the Europa League this season along with Tottenham.